A book-of-record-ish, design side of the Silicon Valley story that many are not familiar with. Anecdotes guaranteed. California’s Silicon Valley is home to the greatest concentration of designers in the world: corporate design offices at flagship technology companies and volunteers at nonprofit NGOs; global design consultancies and boutique studios; research laboratories and academic design programs. Together they form the interconnected network that is Silicon Valley. Apple products are famously “Designed in California,” but, as Barry Katz shows in this first-ever, extensively illustrated history, the role of design in Silicon Valley began decades before Steve Jobs and Steve Wozniak dreamed up Apple in a garage. 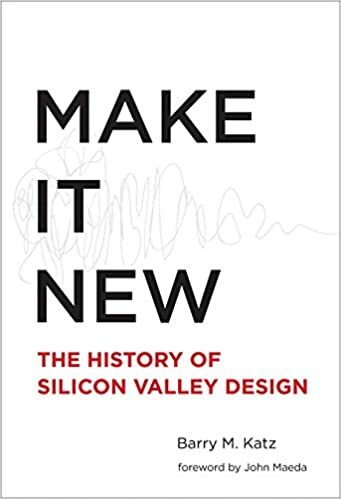 Offering a thoroughly original view of the subject, Katz tells how design helped transform Silicon Valley into the most powerful engine of innovation in the world. From Hewlett-Packard and Ampex in the 1950s to Google and Facebook today, design has provided the bridge between research and development, art and engineering, technical performance and human behavior. Katz traces the origins of all of the leading consultancies — including IDEO, frog, and Lunar — and shows the process by which some of the world’s most influential companies came to place design at the center of their business strategies. At the same time, universities, foundations, and even governments have learned to apply “design thinking” to their missions. Drawing on unprecedented access to a vast array of primary sources and interviews with nearly every influential design leader — including Douglas Engelbart, Steve Jobs, and Don Norman — Katz reveals design to be the missing link in Silicon Valley’s ecosystem of innovation. I just finished it and had been enjoying the story along the way, so I’d recommend the book to anyone who ever wonders whether there’s any, if at all, untold story about one of the well documented cultural phenomena. Although the author intentionally avoids the stuff that’s already over-documented, such as Steve Jobs anecdotes, the story becomes familar once in a while because some scenarios are just too important to omit. What I really like about the book is that, again, it debunks the “loner” myth. No history or momentum is a loner story, it’s always about everything/everyone, often diverse and unexpected (yet seems inevitable in afterthought) things/people, coming together and collectively shaping how it was. The best companion of the book could be Walter Isaacson’s The Innovators.